No Spreadsheets. No Eligibility Charts. No Group Emails. No Wasted Time. Through local leagues, youth baseball coaches are the backbone of the sport. They devote countless hours to teaching players how to play the game during practice and games. They coach in their spare time after working all day and their lives are busy. Adding additional time requirements by having to manually keep up with pitch count regulations is an unnecessary burden. The same can be said for those volunteers who run and manage each local youth league. Their lives are very busy as well and they don’t need more administrative duties added to their list of responsibilities either. Pitch count regulations bring a host of additional administrative burdens that go far beyond just counting pitches thrown in a game. Coaches and league officials have to know who’s available to pitch, who’s unavailable, when can they pitch again, how many pitches do they have left and they need this information quickly and easily. Running spreadsheets and eligibility charts takes time and distributing this information to everyone involved takes more time. But there’s a simple solution: the PitchKount system. PitchKount is an easy to use, comprehensive management system that saves coaches and league officials valuable time while providing the information they need to effectively lead their teams and leagues. With PitchKount, it takes just minutes to input a game report and have team specific pitching reports for all the coaches to see. How can I trust that the players who pitched and their recorded pitch counts are accurate? The PitchKount system offers various methods for recording accurate pitch count data with each having its own verification process. It appears the team we played misreported their data. How does this get corrected? If there is a dispute about the pitcher(s) and/or their recorded pitch count, PitchKount provides a specific process to investigate and resolve the issue. Do I have to determine the days of rest for my pitchers and constantly keep track of it? Not with PitchKount, it automatically performs these functions for you. 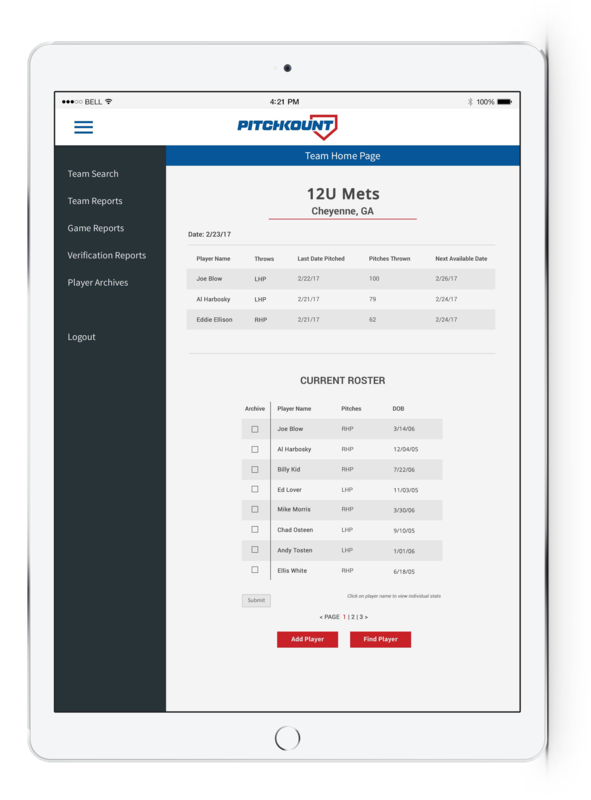 Using the verified data and your specific league’s rules, PitchKount determines each pitcher’s “Next Available Date” and provides this information to you in a daily Pitching Report. How can I prevent using an ineligible pitcher and having to forfeit a game? PitchKount provides each team with a Pitching Report that lists those players who are not eligible to pitch. This report updates in real-time and coaches can print it out or use a mobile device to access it from the dugout. How do I know which players on the opposing team are not eligible to pitch? With PitchKount, you can view your opponent’s current Pitching Report. Any listed players are not eligible to pitch that day. Print a copy for the dugout or pull it up using your mobile device. Either way, you’re in the know. How do I know that other teams are abiding by the pitch count rules? PitchKount verifies the accuracy of the recorded data, automatically determines each pitcher’s “Next Available Date” and then provides each team’s Pitching Report for all to see. Because of these checks and balances, PitchKount puts all teams on a level playing field. I had a parent question whether their son was being over pitched. How can I disprove this? PitchKount provides each player with an Individual Player Card detailing the dates he pitched and the number of pitches thrown. It lists the dates in chronological order and season by season. You’ll easily be able to show a player’s workload over time. This information can also assist coaches in managing individual players and/or see trends in a player’s performance. Does PitchKount create an additional administrative burden? Quite the contrary, it reduces it. As a cloud based, independent application that does not require any type of download or software installation, PitchKount provides a low-touch, comprehensive solution to managing pitch count rules. Coaches and and league officials won’t be tasked with record keeping, verifying data or determining required days of rest. What happens if our Athletic Association’s rules change in the future? Each year, the PitchKount system is updated with each Athletic Association’s current rules. So, as rules change and evolve over time, so will PitchKount! No. PitchKount is a web based application that can be accessed from any computer or mobile device that has an internet connection.